Viruses: From Understanding to Investigation provides students with a map for lifetime learning by presenting the definition and unique characteristics of viruses, including major topics, such as the virus lifecycle, structure, taxonomy, evolution, history, host-virus interactions and methods to study viruses. 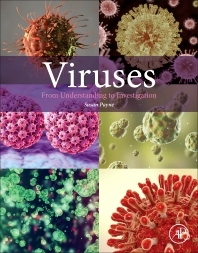 In addition, the book assesses the connections between, and among, the aforementioned topics, providing an integrated approach and in-depth understanding of how viruses work. Susan Payne's primary research interest is the molecular aspects of viral replication, pathogenesis, and evolution. The major focus of her laboratory is the retrovirus, equine infectious anemia virus. EIAV studies include evolution of virulence during rapid virus passage, modification of cell signaling pathways mediated by viral glycoproteins, effects of proinflammatory cytokines on virus replication and disease, and detailed mapping of EIAV virulence determinants. She also studies the recently discovered avian bornavirus, etiological agent of proventricular dilatation disease of parrots, in conjunction with colleagues from the Schubot center. Viruses : From understanding to Investigation. Susan Payne. Publ. Academic Press. As a Master’s degree Programme Leader I like to keep abreast with the latest textbooks in my area and I am aware of four, fairly similar, although very good, virology textbooks that have been published over the last couple of years. Viruses: From Understanding to Investigation is now the fifth. I must admit, I’m still a little perplexed by the title. It isn’t so different from the other recently-published textbooks, and is probably most similar to Molecular Virology of Human Pathogenic Viruses by Ryu, also published by Academic Press. In my opinion the most significant difference between these books is that Viruses: From Understanding to Investigation is almost twice the price (£55 vs £99 for the paperback versions). One might be prepared to pay extra for a more up-to-date book but these books are only a year apart so I do not understand why there is so much difference in price. Having said that, Viruses: From Understanding to Investigation is a very good virology textbook, covering viral structures, interactions with the host cell, techniques used to study viruses, transmission, immunity, evolution and pathogenesis, before focusing in on details of each family of RNA and DNA viruses. The illustrations are very clear and engaging, making it a very attractive and informative textbook. I’m sure that enthusiastic undergraduates and postgraduate students will find this book very helpful in their understanding and investigation of viruses, but if they do purchase a textbook, I strongly suspect they will opt for a cheaper one.